Al Ahli Sports Club Doha (D1) agreed terms with 22-year old American guard Silas Melson (193-84kg-96, college: Gonzaga). He started the season at Hapoel Beer Sheva in Israeli Winner League. In 8 games he had 6.6ppg and 1.6rpg this season. The last season Melson played at Gonzaga University in NCAA where in 37 games he recorded 9.3ppg, 3.1rpg, 2.2apg and 1.1spg. He helped them to win WCC Tournament and end the regular season at the top position. Quite impressive season as he was named to All-WCC Honorable Mention. 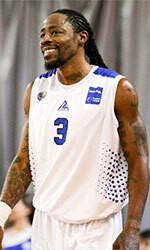 Melson is a former Eurobasket Summer League player, which is considered top international summer league on the market. He attended Gonzaga University until 2018 and it is his first season as a professional player.